After a year out of coaching, Bruce Arians said the Tampa Bay Buccaneers' offer was too good to pass up. Last week, Arians, who was head coach of the Arizona Cardinals from 2013-17, was introduced as the Buccaneers' new head coach. 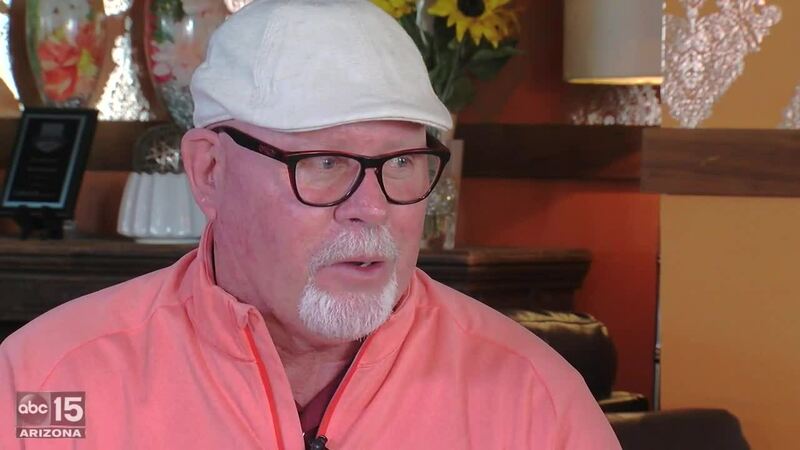 "It just fell into place all of a sudden," Arians told ABC15's Craig Fouhy on Wednesday while in the Valley to promote the upcoming Arians Family Foundation golf tournament. Arians' foundation benefits children who are in the court system as a result of abuse or neglect. "As I did broadcasting this year, I went from team to team. I knew how much I missed the locker room and the brotherhood of the locker room. All the stars aligned, and this job fell in there," he said. The move makes sense on a number of levels for Arians, a Georgia resident who doesn't live far from Tampa. Arians is close with Buccaneers general manager Jason Licht, who worked in the Cardinals' organization during Arians' first two years in Arizona. And he was able to bring several members of his previous coaching staff with him to Tampa, including former Cardinals defensive coordinator Todd Bowles. "I was getting more and more excited as I was doing games this year about coaching again, but it had to be like the perfect fit. And (the Buccaneers are) the perfect fit. It’s close, great ownership, a friend as a general manager, a quarterback, and my entire staff is available," Arians said. After retiring following the 2017 season, Arians joined the CBS NFL broadcasting team. He said he enjoyed the job but just wasn't able to quite be himself, especially when it came to not cussing -- something any Cardinals fan who's watched the Cardinals' "All or Nothing" Amazon documentary will understand. "That’s the hardest thing for me, to describe a play and not use the words I normally use. None of that was gonna fly on television. I would’ve gotten fired real fast." Arians had cited his health as one of the reasons for stepping down as Cards coach. But he said doctors gave him a positive report -- relatively speaking -- when he decided he wanted to return to coaching. "I got a complete physical for the (Buccaneers) interview, and I got a C. That’s the best I’ve had in 10 years," he said. "(My wife) saw me getting excited as this whole thing started to unfold, and then the reception we got when we walked into the building was amazing." Arians said he didn't consider any other NFL job except the one in Tampa Bay. He said the Cardinals didn't call him, and he didn't call them, after his predecessor in Arizona, Steve Wilks, was fired after just one season. "It never really crossed either bridge. It was just straight down to Tampa, and it was over," he said. "I’m super excited and looking forward to this next adventure." The golf tournament in March will be the Arians Family Foundation's last in Arizona -- but Arians said his charity will continue to be active in the state. "Financially, our foundation will continue to support everyone in Arizona," he said.